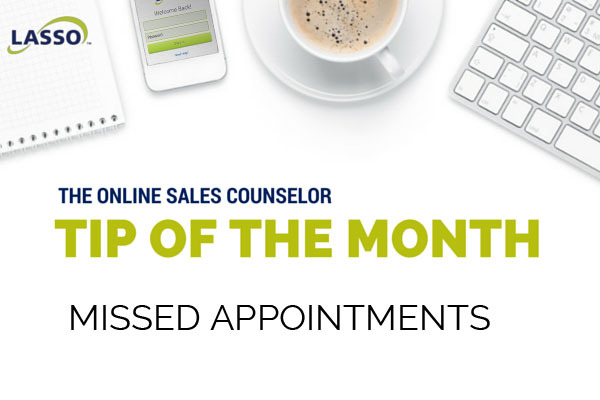 As an Online Sales Counselor we track our scheduled and kept appointments, but are you tracking missed appointments? It’s not fun to do, but it’s one of the activities that separates the best OSC’s from the rest. In all fairness, you may not have done anything wrong, but OSC’s typically are not paid until they schedule an appointment. By tracking missed appointments (people who just show up in the model, or who buy a home but never engaged), you continue to question and improve upon your activities. Examples are making changes to your emails and voice messages, just to see if something else might work better. Tracking missed appointments is not about beating yourself up; it’s about tracking buying and appointment-setting patterns, and consistently reworking your strategy.